Hippies and The Anti-War Movement Unite The Human Be-In developed out of the success of the Love Pageant Rally, the first San Francisco outdoor rock and roll celebration that Allen Cohen and Michael Bowen and a collaborative circle of friends produced on October 6, 1966, the day LSD became illegal in California. We had realized that the change in consciousness and culture we were experiencing had to be communicated throughout the world. We felt that the ideals of Peace, Love and Community based on the transcendental vision could transform the world and end the war in Vietnam. In short, we wanted to turn the world on and to do it we would need to attract the spotlight from center stage Washington and Vietnam to center stage Haight-Ashbury. Michael Bowen centered much of the organizing energy for the Be-In from his pad at Haight and Masonic. In addition to his expressionist painting and drawing, he was friends with the Beat poets from the North Beach era, and had spent time with Tim Leary at Millbrook. He was a mystic hustler who Allen Ginsberg had called the most convincing man he had ever known. He could charm the press and turn on a square. And he did. 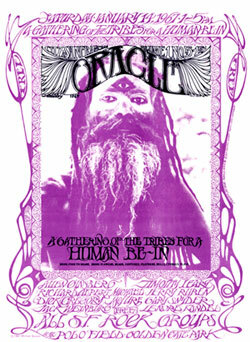 He invited Leary and the Beat poets to the Human Be-In, and arranged for it to be a worldwide media event. Bowen and I had become concerned about the philosophical split that was developing in the youth movement. The anti-war and free speech movement in Berkeley thought the Hippies were too disengaged and spaced out. Their influence might draw the young away from resistance to the war. The Hippies thought the anti-war movement was doomed to endless confrontations with the establishment which would recoil with violence and fascism. We decided that to strengthen the youth culture, we had to bring the two poles together. In order to have a Human Be-In we would have to have a powwow. We met with Jerry Rubin, Max Scheer and other Berkeley activists, and shared our ideas about directing magical and conscious energy towards the Pentagon in order to overcome its impregnability as both the symbol and seat of evil. We had developed this magical concept to exorcise the Pentagon from the writings of Lewis Mumford and the visions of Charlie Brown, the peyote shaman. The idea to exorcise the Pentagon would be realized in the March on Washington in October where we warned that we would form a ring of hippies with joined hands around the Pentagon and raise it 15 feet in the air and turn it orange. Rubin and Jack Weinberg were invited to speak at the Be-In, and Max Scheer agreed to announce and support the Be-In in the Berkeley Barb. The Gathering of the Tribes in a "union of love and activism" was an overwhelming success. Over twenty thousand people came to the Polo Fields in Golden Gate Park. The psychedelic bands played: Jefferson Airplane, The Grateful Dead, and Quicksilver Messenger Service. Poets Allen Ginsberg, Gary Snyder, Michael McClure, Lawrence Ferlinghetti, Lew Welch, and Lenore Kandel read, chanted and sang. Tim Leary told everyone to Turn on, Tune in and Dropout; the Diggers gave out free food. The Hell's Angels guarded the generator cables that someone had cut. Owsley Stanley gave out free acid; a parachutist dropped like an angel from the sky and the whole world watched on the evening news. Soon there would be Be-Ins and Love-Ins from Texas to Paris, and the psychedelic and political aspects of the youth culture would continue to grow hand in hand everywhere.